Land Rover is preparing to unveil the new 2015 Range Rover Evoque - a modest facelift for one of those hard-to-revise models. Like the Mini or VW Beetle, the Evoque's distinctive styling makes it a tricky candidate for mid-life facelift treatment. Which explains why Land Rover is seemingly not changing it much. Click here for our Evoque long-term test review. 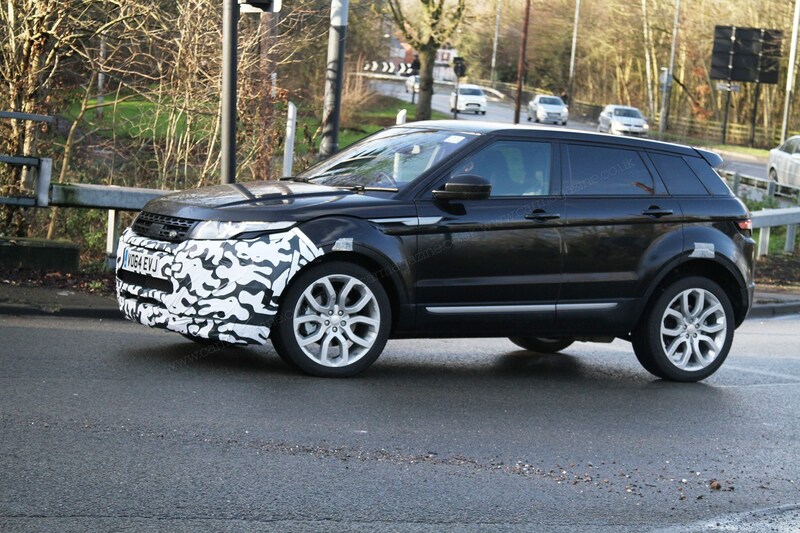 Our new spyshots, taken near Land Rover's tech base in the West Midlands, reveal the mid-life facelift ahead of a planned introduction later in spring 2015. Cosmetically, it's business as usual. The disguise on this prototype suggests there will be a minor tidy-up at the front end, although even a close-up study of our photos suggests that the general theme at the front is the same. Don't forget, on CAR's new responsive website you can zoom in on photos on desktop devices; try using the magnifying glass icons in our gallery, or use the roller-ball on your mouse. Expect some minor front spoiler tweakery then - and perhaps some refreshed lighting motifs - and perhaps some updated, softer 'castellations' on the wheelarches, judging by the strategically placed masking tape above each axle. But the biggest news is underneath, where CAR understands the 2015 Evoque will adopt the latest Jaguar Land Rover (JLR) Ingenium engines. This test car is registered with a 2.0-litre diesel engine matching the Jag XE's 1999cc capacity. JLR has spent a £500 million fortune on its new engine plant just outside Wolverhampton to build new four-cylinder engines to take up the slack from the terminating Ford/PSA engine supply deal. Result? In the XE, the 2.0 D produces 161bhp and 280lb ft, mostly mated to the ZF eight-speed automatic. And while the Evoque is unlikely to match the aluminium XE's 99g/km of CO2 potential, it's surely bound to offer a good cut in emissions on Land Rover's fashionable 4x4.